By default, Yandex searches for images without considering when they were posted. In search results, the time of posting is only listed for pictures that were uploaded less than a month ago. If no recent images are found based on your search, you will be directed to results from other search engines. Large — for images larger than 1024×768 pixels. Medium — for images between 400×300 and 1024×768 pixels. Small — for images smaller than 400×300 pixels. Your image search results will indicate the size of the image. You can also specify image size manually. Just enter the appropriate values and click OK.
Wallpapers are images that you can set as your computer's desktop background. Wallpaper size must meet the standard requirements of 800×600 to 2048×1536 pixels. You can also set the image proportions you want: landscape, portrait, or square. Photo — for photographs or images that look like photos. Use this filter if you want to exclude maps and other graphics from search results. With white background — for images displayed against a solid white background. Pictures and drawings — for illustrations. Select this type if you are looking for drawings, blueprints, maps, or paintings. People — for close-ups of faces. Demotivators — images in demotivator style. Computer vision algorithms filter images by type and color. The contents of each image are analyzed using special algorithms that determine their characteristics. If you want to find an object or background of a certain hue, use the color filter. To make searching more convenient, all gradients are grouped into nine main colors. You can also filter out color or black-and-white images. You can search for images of a certain graphic format using the appropriate file format parameter: JPEG, PNG or GIF. 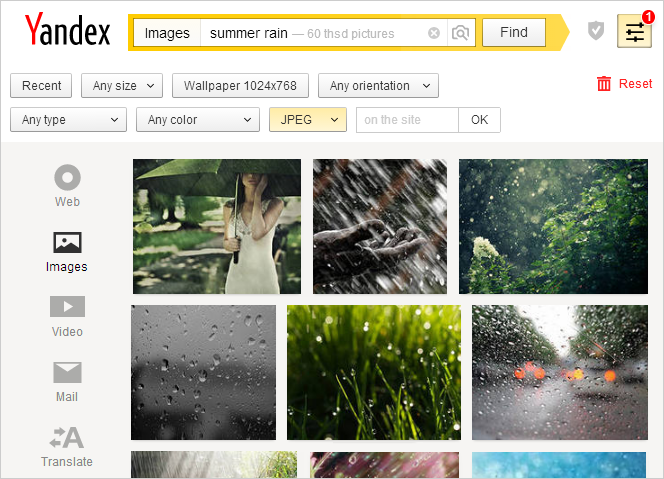 Yandex searches for images of all formats by default. To search for images from a particular site, type the URL in the On Site field.